Summit Racing now offers ST Suspensions Coil-Over Kits.The kits improve handling by reducing body roll during compression--ST Suspensions thoroughly tunes and tests the kits for specific vehicle applications to ensure optimal ride and handling characteristics. The coil-overs feature an adjustable ride height, which means drivers can dial-in the suspension to match their driving style. It also means the vehicle can be set at the perfect height for the road conditions—handy for folks with steep driveways and pothole-ridden commutes. The coil-overs have galvanized struts for corrosion resistance. The twin-tube struts also have a chrome-plated piston rod for maximum longevity and high-quality seals to keep dirt and dust out, preventing premature wear. 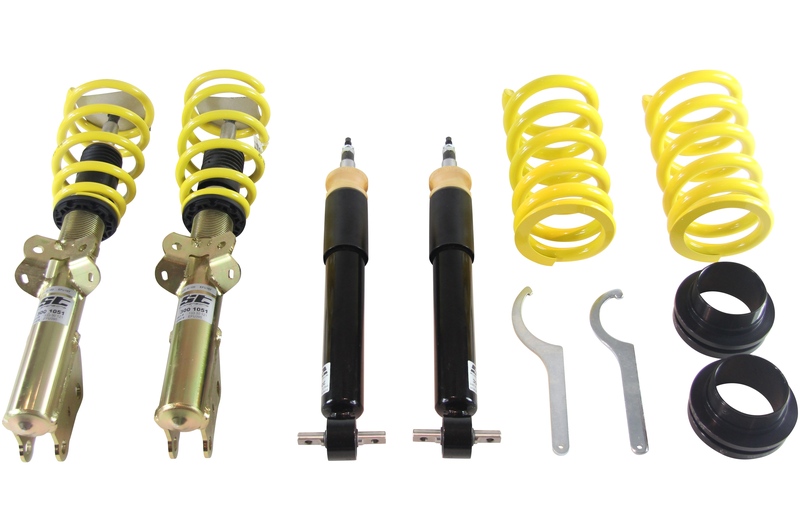 ST Suspension Coil-Over Kits include coil-over assemblies for both front and rear. Depending on the kit, the stock shock mounts, spring caps, and top hats may be reused. Popular applications include the Ford Mustang and Dodge Challenger/Charger, plus a wide range of import and tuner cars.